The first transcatheter aortic valve replacement (TAVR) was performed by Cribier and colleagues in 2002 in a compassionate case of inoperable patient admitted for cardiogenic shock as a consequence of severe symptomatic aortic valve stenosis . Thereafter, after a long period of technical development and animal studies, a large amount of literature reported promising results that confirmed the feasibility of TAVR [2–9]. Since commencing of its clinical application, about 100,000 transcatheter valves have been implanted worldwide, and the rate of implants is sharply increasing. The results of several large multicenter registries [10–18], and the prospective randomized trials [19–22], consistently showed that this treatment can be reasonably considered the standard of care for high or prohibitive surgical risk patients with severe symptomatic aortic stenosis. The recently published randomized CoreValve US High-Risk Pivotal Trial  was the first to demonstrate a significantly higher rate of survival at 1 year with TAVR compared with SAVR in high-risk patients. More recent publications [23–25] have shown by means of propensity score matching no difference in terms of mortality even in lower-risk patients. These groundbreaking results achieved in the last decade are a consequence of the progressive technological improvement of the devices and of operator’s experience. The size of the valves and delivery systems decreased from very large size, 24–25 Fr of the initial devices to the current 14–18 Fr, thus increasing the deliverability through the femoral route and reducing the access complication rate. The accurate sizing and procedure planning obtained with the routine use of CT scan allowed the physicians to choose the optimal approach and to minimize the paravalvular leaks that still remains the major Achilles heel of this procedure. 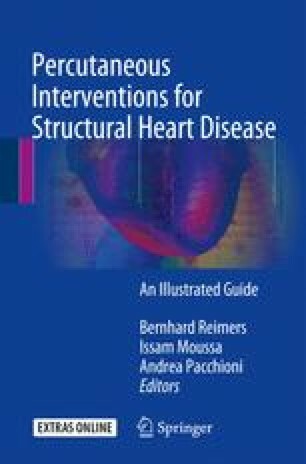 The objective of this chapter is to provide a comprehensive review on technical and procedural aspects of TAVR, to discuss acute and late outcomes, and to highlight the current expectations and potential future development of this rapidly evolving technology.